Vassap b33t farmers. 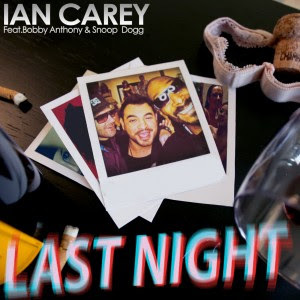 Today, I got 2 hot remixes of Ian Carrey's track, Last Night. The original blows nuts, but luckily, Afrojack and Spencer & Hill decided to do a small favor for Mr. Carrey and transform his monotonous production into a slapping club anthem that will have women ripping off clothing and every phrat boy pumping their steroid-filled arms 100 mph. Afrojack has evolved immensely over the past few years, improving every aspect of his production style and matching himself against some of the best in the business. In this remix, he playful incorporates smooth, robotic crescendos with his signature horns, that pulls in the listener ever so gently. Without any regard, he shuts it down with heavy, dirty dutch bass, causing serious head trauma. Instead of referencing urination the entire track, Spencer & Hill actually uses a majority of the vocals from the original song...which I find more pleasant to listen to. The remix differs from the original in the simple fact that it actually sounds good. Masters of inappropriate, electro-house, your ears will feel violated when it drops. This b33t finely rides the line of being a stadium rave-banger or something that will get overplayed in every club in the world. Good shvt.